The combination of caustic substances in dehorning paste cauterizes tissue and prevents horn growth. 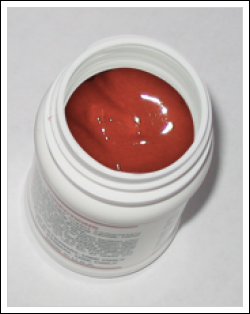 Dehorning paste is applied to the horn buds of calves eight weeks of age or younger. Advantages: Bloodless; non-invasive; less painful than hot-iron disbudding*; less risk of injury to the calf handler. Disadvantages: Calf cannot be exposed to rain or allowed near other animals for six hours; cannot be used in calves over eight weeks of age. *Vickers, K.J., et al. Calf Response to Caustic Paste and Hot-Iron Dehorning Using Sedation With and Without Local Anesthetic. J. Dairy Sci. 88: 1454-1459, 2005.